Hi my friends! I have a fun new challenge for you and myself. It would be fun if you could join me! Today's challenge is all about wrapping of gifts, which will come in handy for the festive season to come. Rules? Buy a loved one (or even yourself!) a small gift and wrap it as nicely as you can. Think outside of the box. 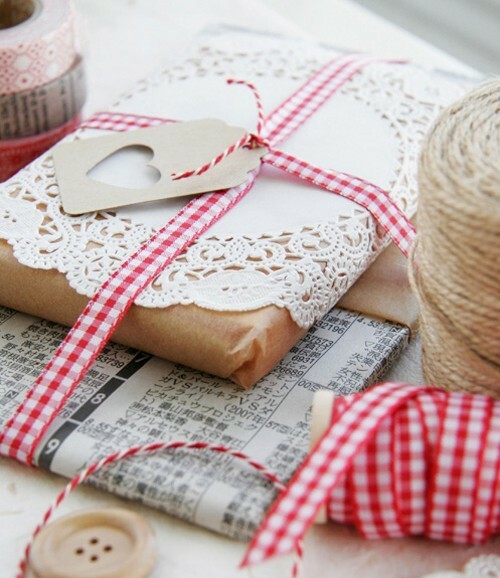 Use ribbon, doilies, tags, stamps. Have fun with it! Want to participate? All you have to do is be a follower of this blog and leave a comment. That's all! The challenge starts today and ends next thursday, when I will post my result. Let's have some fun with this! So glad you came and joined my Facebook Follow Fesr. I would never have seen this otherwise. I hope I get time to join in. New follower though. Wonderful to have you Rosie!